Neil signed up for the events to raise money for Pancreatic Cancer UK, Pancreatic Cancer Action and Pancreatic Cancer Awareness, after losing his mother to the condition just two months after she received her diagnosis. Neil's mum had been a nurse: "She had cared for so many others throughout her life, so I want to do something to help those going through what she went through." The first challenge was the Sheffield 10km in September. The following month Neil took part in the Yorkshire 10 Mile event. His finale on 3 November was to the Robin Hood Off-Road Duathlon. "For several weeks I had been suffering with a tight left calf muscle so I knew all three events were going to be tough, for various reasons," Neil said. "The Sheffield 10k was going to be my first competitive run in well over 11 years, back when I was in my thirties. I set off at a nice steady pace hoping to finish around the 60 minute mark, so I was more than happy to achieve 55 minutes, finishing strong and still in one piece." Three weeks later Neil faced the York 10 Mile Race; the course made all the more difficult thanks to horrendous weather. "All morning there was heavy rain so everyone was soaked even before the start. It rained throughout the race and continued until well after the finish. I had a steady pace at the start which I was able to keep throughout; it was only in the last mile going up the hill to the finishing straight that every muscle in my legs started to hurt. I finished in 1:27:17 absolutely soaked through to the skin but buzzing with the time." Neil had three weeks until his final event so took advantage of a brief rest. He tried running after a week, but his calf was so tight he could only manage a mile. He ploughed on regardless, determined to complete the third and final challenge: an off-road duathlon through the Sherwood Pines. "I took the first 5km run easy, as there were still the two other sections to go," Neil said. "The majority of the 16km cycle course is on tracks through the woods which have room for one cycle at a time. There are various sections offering different challenges - over tree roots and with drops and climbs - which cause areas of congestion as slower riders hold up the ones behind them". "My legs were burning, but I had time to get my breath back following the procession up the track, then overtaking on the firebreaks and paths. I did the last 3.4km plod with stiff legs but was happy to finish on 2 hours 07 minutes." "I have enjoyed both the events and training for them. I have lost a little weight and I feel so much healthier. I have entered the Doncaster 10k at the end of this month and several events are either booked or have my eye for next year. My aim is to beat my age, time wise, for the 10 km." 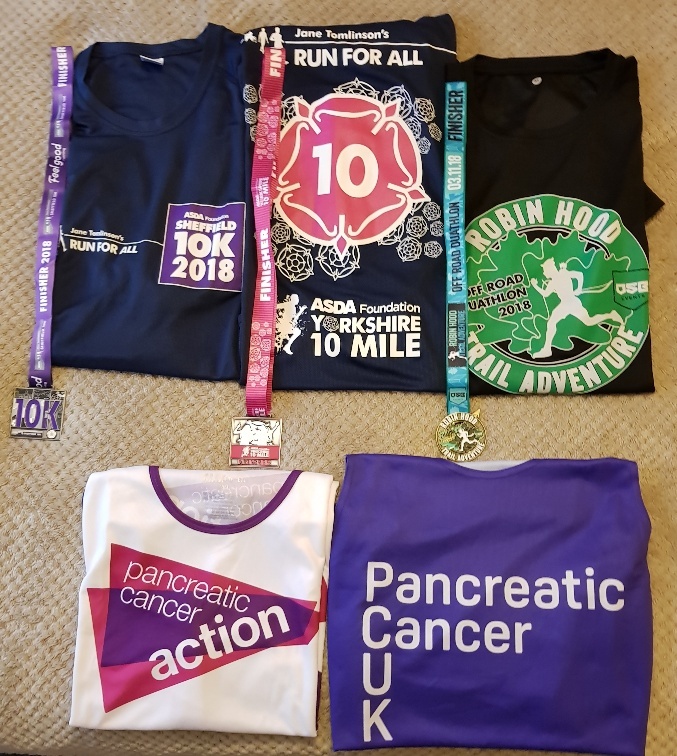 It's not too late to show Neil your support and help boost the total he has raised for the three pancreatic cancer charities he is supporting. You can make a donation here.